It’s pie season! And you know how much we love pies. :) This year, I’m all about hand pies. They’re just so cute and portable! You just need a handful of ingredients . . .
Plus a little love . . . This girl gets so into her cooking! 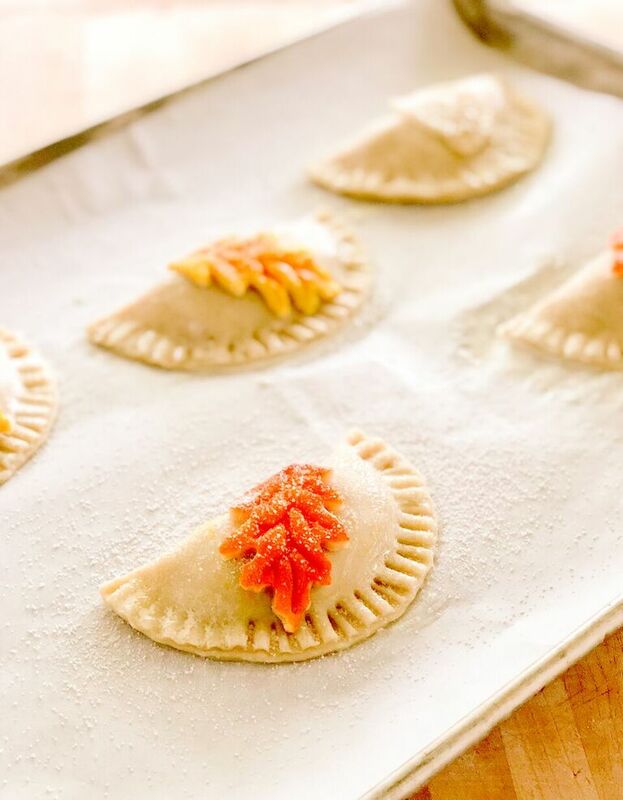 Drop some pumpkin filling on the dough . . .
And seal them up . . .
Then have fun with the leftover dough to create decorations . . . And if you’re up for it, paint with food coloring. Think you might try these this year? I’d love to hear if you do! Fall is the perfect time for pies! 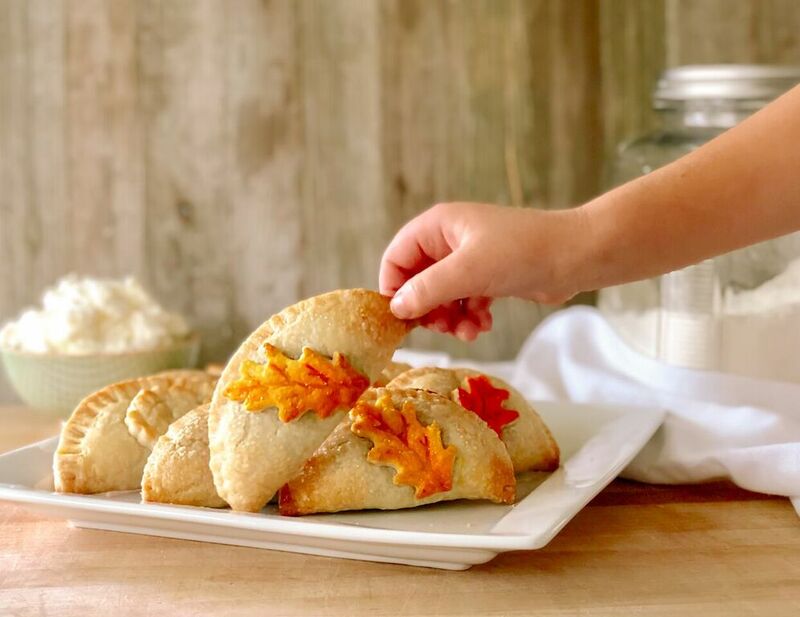 Start a new family tradition with these little hand pies where everyone gets to participate. 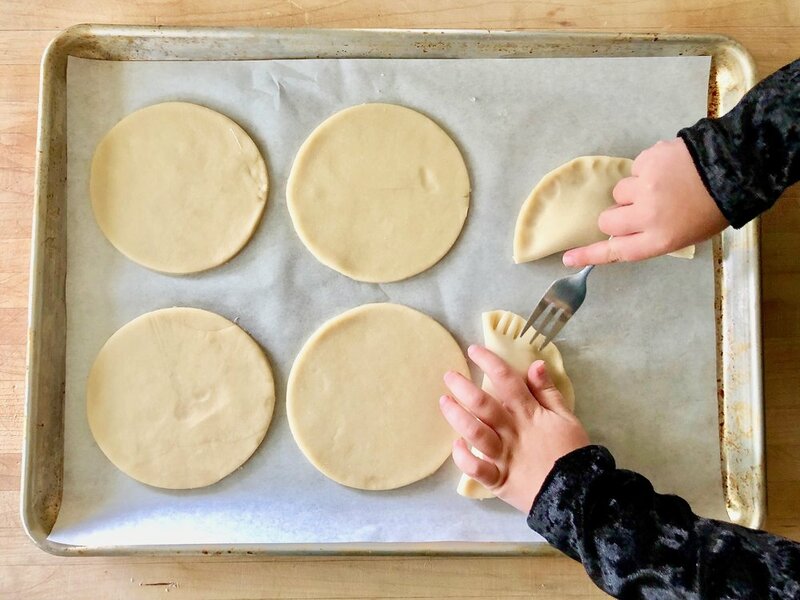 Kids can mix filling, roll dough and paint their own decorations. And they will love to eat these little pies warm out of the oven! Spray a 9-inch pie plate with nonstick spray. Line 3 baking sheets with parchment paper. Preheat oven to 375 degrees F.
Place pumpkin puree, half-and-half, eggs, sugar, salt and pumpkin pie spice in a large mixing bowl. Beat or stir until well combined. Pour pumpkin mixture into the pie plate. Bake for 20 – 25 minutes, or until filling is set in the center. Cool completely. Increase oven temperature to 400 degrees F.
Working with one crust at a time, roll out the crusts on a floured surface. Dough should be rolled thin (about 1/8 to 1/16 inch). If dough is too thick, you’ll have too much crust relative to filling). Using a circular cutter or Tupperware lid, cut out about 5 circles. 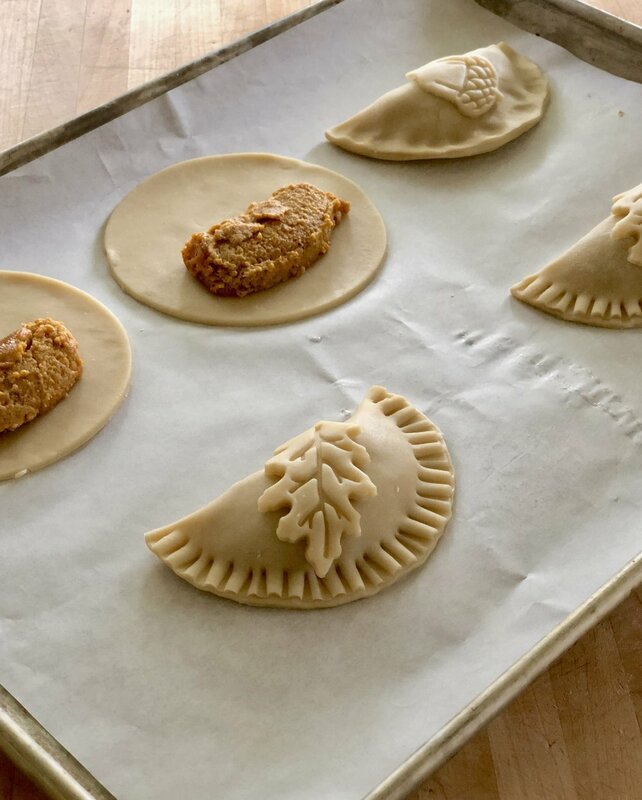 Use the leftover piecrust dough and cookie cutters to make decorations for the pies. Place the circles of dough on lined baking sheets. Spoon about 2 tablespoons pumpkin filling on one side of each dough circle. Dip your finger in water and trace it around the edge of the circle. Fold the dough over the filling and press edges together. Use a fork to create a decorative edge. Use your finger to wet the back of the decorations using water and then stick them on the pies. If you want to add some color, place about 1 teaspoon food coloring in a small bowl and use the brush to paint the food coloring on the decorations. For a glazed look, brush a little half-and-half on the pies (but not on painted decorations) and sprinkle sugar over top. Bake pies for 15 – 20 minutes, or until golden brown. Pies can be stored in an airtight container in the refrigerator for 2 or 3 days.